Black bears are highly intelligent and adaptable. This species has a great capacity to live in close proximity to people. Unfortunately, many bears are shot needlessly because of unfounded fear and human carelessness. Led by a keen sense of smell, bears will naturally gravitate to potential food sources found in unsecured garbage, bird feeders, orchards, farm crops, beehives, outside pet food, and organic compost piles. Bear attacks on humans are extremely rare. A person is 180 times more likely to be killed by a bee and 160,000 times more likely to die in a car accident. 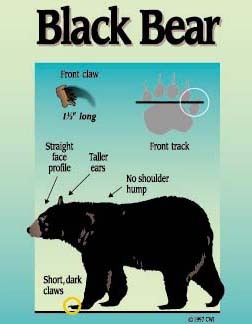 Most injuries from black bears occur when people try to feed, pet, or crowd them. Bears will nip or cuff bad-mannered humans, as they will bad-mannered bears. They are very strong and powerful animals; bears should always be treated with caution and respect. Did you know that although they are called black bears, colors can range from black to cinnamon brown, silver-blue and, occasionally, even white? The white bears are called “Spirit” or “Kermode” bears. Black Bears eat mostly berries, nuts, grasses, carrion, and insect larvae and they have color vision and a keen sense of smell. Black Bears are good tree climbers and swimmers and can run up to 35 miles per hour. They are very intelligent and curiousand they are typically shy and easily frightened. The average weight of Black Bears is 125 to 600 pounds and they can go without food for up to 7 months during hibernation in northern ranges. The average life span in the wild is 18 years but they can live up to 25 years. Black Bears usually give birth to 2 to 3 cubs during the mother’s sleep every other year.